Best-selling picture book creator Christopher Silas Neal is diving into the world of original board books with Animal Colors, a book that humorously mashes up two animals of different colors to create a unique and funny creature! When a blue whale and a yellow lion mix, it makes a . . . 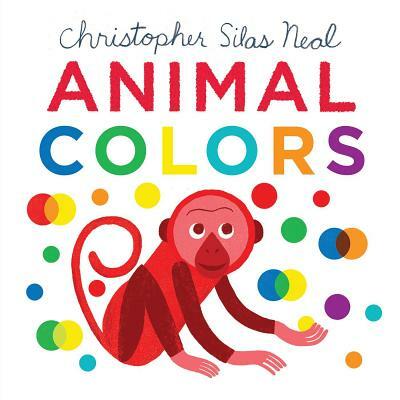 In this delightful board book with bold, striking images, Christopher Silas Neal combines animals of different colors and species to form one unique creature! Children will have endless fun guessing what brand-new, made-up animal will appear next! This book will have them playing and guessing with each reread and features a list of color combinations from the book for kids to reference! Christopher Silas Neal is an illustrator and designer who has published numerous celebrated picture books. He is the illustrator of Up in the Garden and Down in the Dirt (Chronicle Books) as well as Over and Under the Snow (Chronicle Books), which won the E.B. White Read Aloud Award Honor and the Golden Kite Award for Picture Book Text. Neal lives in Brooklyn, New York.